The Glidden paint brand is rolling out a new colorful world in INNOVENTIONS at Epcot, part of the Walt Disney World Resort. The paint brand known for a rich tradition of innovation and color inspiration has collaborated with Walt Disney Imagineers to create a highly interactive color experience called "Colortopia". 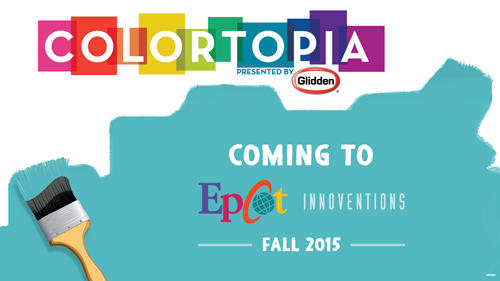 Opening to park visitors in fall 2015, construction is currently underway to bring the Colortopia experience to life for children and adults of all ages. "Pairing the magic of the park experience with the magical role color plays in our lives is an exciting opportunity for the Glidden brand," said Mark Lancia, senior brand manager - Glidden, a brand of PPG Architectural Coatings. "We're excited to share the Colortopia experience with the park’s visitors from around the world." Guests to the Colortopia exhibit will encounter unique interactions through fun and surprising hands-on activities. Park visitors will be able to extend the Colortopia exhibit experience throughout Epcot and to their own homes with a mobile application and website set to launch later this year. The Glidden brand is a line of PPG Architectural Coatings (of PPG Industries), the world’s leading coatings company. To learn more about Glidden paint and their products, visit glidden.com and disney.glidden.com. LOGO: ©2015 Glidden Paint/Walt Disney World Resort. All Rights Reserved. I'm interested in whether this is going to be in place of the test the limits lab, or in the land of tarps at the other side of innoventions. It's going to be in the space formerly occupied by Test the Limits Lab, at INNOVENTIONS East (next to "Take a Nanooze Break").